Here at Advanced Gauging Technologies, we take pride in being innovative. Since our most recent idea is now operational, we wanted to share the exciting news with you! 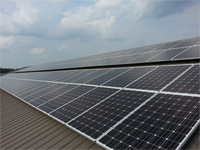 In an effort to be cutting edge and create a more environmentally friendly workplace, we have installed 124 solar panels atop the roof of our Plain City, Ohio offices . Together, these panels produce up to 35 kilowatts of energy per hour, which covers, on average, 96% of our usage. Our website has a list of closeout items that are available at discounted prices. This list is updated on a regular basis and includes items such as Mitutoyo Gauge Block sets and C-frames. To view all closeouts go to www.AdvGauging.com, click on the “Shopping Cart” icon at the top of the page, then click on “Closeout”. 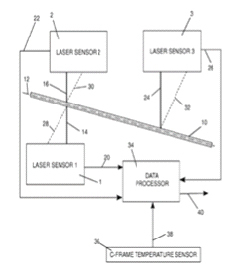 In April of 2014, Advanced Gauging Technologies filed a U.S. patent for the AGT800 Laser Thickness Gauge. The application was under review for more than a year. Recently, we received notice that the examination has been completed and we have been awarded patent number 9151595. We were approved for 13 of 14 submitted claims including our Passline Angle Compensation, C-frame temperature correction (ISOtemp™), and methods of computing laser beam collinearity along and beam dynamics correction factors. AGT’s focus has always been on its customers and throughout our history we’ve worked hard to develop new ideas for evolving thickness gauges to meet customer needs. Companies love the AGT800 Laser Thickness Gauge and that, along with confirmation of its innovative technology via a U.S. patent, is something we are very proud of. A.G.T. is offering a new, limited-time program for upgrading older legacy / obsolete thickness gauges, many of which were manufactured by companies that have been out of business for a decade or longer. We have always worked hard to keep these outdated gauges operational by providing specialized service and maintaining inventory on spare parts. However, locating many of these key components is becoming increasingly difficult. The following gauge models are eligible for upgrades under this program: GR100, GR200, GR2000, DMC 410, DMC 420, DMC 450, IRM IR-1000, Loral 3500, Measurex MDX-350, Radiometrie RM206 and Weston 5310.